yep. fiddle diddles. as far as I can tell they are very much like macaroons. macaroons with a sweet name, that is. these are the first thing I can recall baking on my "own" when I was young. I remember my friend and I "baking" these in about grade four...trying to understand the measurements, and just hoping for the best. good thing this recipe is super easy...and is actually a NO BAKE recipe. perfect for kids, and for hot summer days. this version has been veganized, macrobiotic-ish-ified, and is pretty dang tasty. 3 cups gf oats - quick cooking (not instant) is better here, but regular will be ok too! Put coconut oil, sugar, & milk into a saucepan. Heat over medium, stirring often, until it comes to a boil. Remove pan from heat. Add / stir in the remaining ingredients, in the order listed. Drop by rounded tablespoon fulls onto a wax paper covered cookie sheet. Cool completely - I put mine in the freezer, as coconut oil firms up well this way. Store in the freezer, and let thaw a few minutes before eating. If the mixture just seems way too crumbly to drop by the spoonful, then use your hands and squish into balls - that's what I did. You could also add in a bit of maple syrup, if you want them to stick together more. Feel free to melt in peanut butter or any other nut butter, with the wet ingredients. I'm sure it'd be fantastic. These guys were inspired by an insanely delicious treat at a bakery awhile back. Of course they aren't quite the same, as I don't often use or eat eggs or butter, but they did the trick when the craving struck. They are the perfect mix of crumbly, crispy, and chewy and they are oaty and chocolatey. I don't really need to say any more. These guys are vegan of course, and gluten free too. 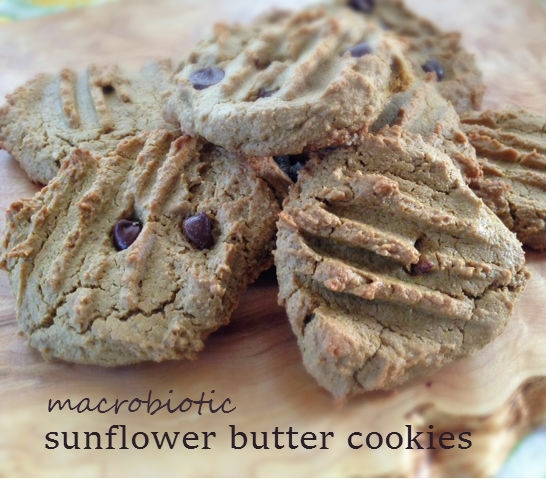 They are Macrobiotic friendly in the sense that they use whole & natural foods - but they do have chocolate chips and coconut, making them more of a playful choice, on the outskirts of regular daily foods. They sure are yum, though. Recipe makes 6 large cookies. Drop the coconut oil into the dry and either use a pastry cutter, a fork, or crumble/rub the oil in with your fingers (I used my fingers). Mix wet ingredients in a bowl, and stir into dry. I used a fork to mix them together. Using your hands, roll 6 large balls from the dough, and place onto cookie sheet. Press down with your hand, or a fork. Bake for 15 mins. Let cool on cookie sheet for 10 minutes, then move to a rack. I love lemons. And I love berries. And the weather has been beautiful these days. So naturally I wanted to create something that involved all of these happy things. Kantens are a classic Macrobiotic treat, and are a delicious way to enjoy whatever fruit your heart desires. For this version, I wanted to use up some frozen berries I had, and just so happened to have some delightful pear juice on hand. Feel free to be creative with your juice & fruit choices. optional: a few spoons of rice syrup or maple syrup, if you want something a bit sweeter. 2 cups frozen berries of choice. (I used a blackberry, blueberry and black currant mix). Fresh berries work great too! *** For the agar agar: I still had a bit of powder from Japan, and it came in 4 gram packs, meant to gel up 2 cups of liquid. If you don't have these convenient packages, and are using agar flakes, 2 tbsp should do the trick, and if you are using agar powder use 2 tsp. For more info on what kanten/agar is, please check out my previous Macro Monday post on it here! Put frozen berries into a bowl, or pyrex dish - just something that will hold about 4 cups ( I used a big round glass tupperware, it all fit perfectly, and I could easily pop a lid on to put it in the fridge). Add juice, a pinch of sea salt, lemon zest, & sweetener (if using) to a saucepan. Whisk in the kanten powder, and bring mixture to a boil over low heat. Stir until dissolved (should only take a few minutes with powder). Pour mixture over frozen berries. Let cool completely. Mixture will set as it cools. You can put it in the fridge and enjoy it within a few hours, or wait and eat it the next day. Serve it up how you like - in slices, or by the spoonful! If you like lemons a lot, feel free to serve with some lemon slices as I did, and it will get all juicy and wonderful and the sourness is just perfect with all the berries. Nature is the best medicine, and sunshine on your face, with a touch of something simple & refreshing afterwards is probably one of the best things ever, in my opinion. Have a FRESH, FUN, and DELIGHFTUL weekend outdoors, friends. Chestnuts are one of my favourite things to eat. They have such a unique texture & flavour, and peeling them out of their roasted shells is kinda fun :) It must be a genetic predisposition to love anything that has chestnut in it, because my sister and I, along with our Nana and mom, all share a love for fresh roasted chestnuts...and desserts that use chestnut puree. With my chestnut love in mind, I purchased some pure Italian chestnut flour awhile ago - both exciting & new to me - and have been meaning to try it out. Lightly sweetened, crunchy and chewy on the outside, fluffy on the inside, gluten free cookies made with chestnut flour & rolled oats. The texture is similar to a macaroon (the most similar I've experienced, outside of an actual macaroon, anyways!). Add in any dried fruit, seeds, or treats you like to change up the flavour. 1/4 - 1/2 cup mixins - currants, dark chocolate chips, cocoa nibs, raisins, seeds, your choice! Preheat oven to 350F. Place a sheet of parchment paper on a cookie sheet. Mix first five ingredients in a bowl. Mix syrup, oil, water & vanilla in a bowl. Add wet to dry. Stir until combined. Add in any mixins of your choice. (I used 1/4 cup currants because I was out of raisins and anything else, but scooped some out plain first). Scoop out dough by the teaspoon, and drop onto cookie sheet. Bake for ~15 minutes (check at 10 minutes). If you don't have chestnut flour, or aren't a fan of the flavour, I'm certain you could simply use whole wheat pastry flour, spelt flour, or a gluten free mix with no problems. This is my first time using chestnut flour, and I am kinda excited...the texture of these cookies is unlike any other flour (especially gf flour) I have used. As I mentioned above, the texture is so chewy - almost like a real macaroon made with egg whites. I want to experiment some more with it, and see what else I can come up with. Have you ever made anything with chestnut flour before? Enjoy, my sweet friends, and have a great weekend! Phew - it has been a bit crazy busy these past few weeks. I haven't been able to spend nearly as much time in the kitchen baking, as I'd like to. So, today's treat is a link to a previous recipe I posted. Check out the post HERE to get the recipe. I have included multiple crust options, including a gluten free version, and multiple filling options. You can put on the glaze, or not. You can line the crust with some dark chocolate for a more decadent treat - or not. Lots of love to you friends. This week I didn't manage to fit any baking in, so instead I finally got around to posting a recipe & photo from a few summers ago. It was amazingly delicious, and T just saw the photo and said "oh yeah, that was good, you should make it again" - so maybe I'll just have to, now that I have the recipe easily accessible. optional 1 tsp baking powder (I used it once with, once without, and both worked just fine). 200 g grated or ground almonds (not super fine almond flour, keep a bit of a texture - you can try doing this in a blender, but I have a hand nut grinder I use for this). Mix maple syrup & oil together, and then add all the remaining ingredients (except for jam) together to form a ball (knead with your hands). If dough is too dry, add a tiny bit of water, and if it's too wet, add a bit more flour. Chill dough in freezer for about a 1/2 hour. Remove dough from freezer, and set aside 1/3 of it for the lattice topping. Lightly oil the bottom of a tart pan (mine was a tart pan with a removable bottom, but my family usually uses a spring form pan). You can place a piece of parchment paper cut out into a circular shape on top of the oiled bottom if you wish, as well. 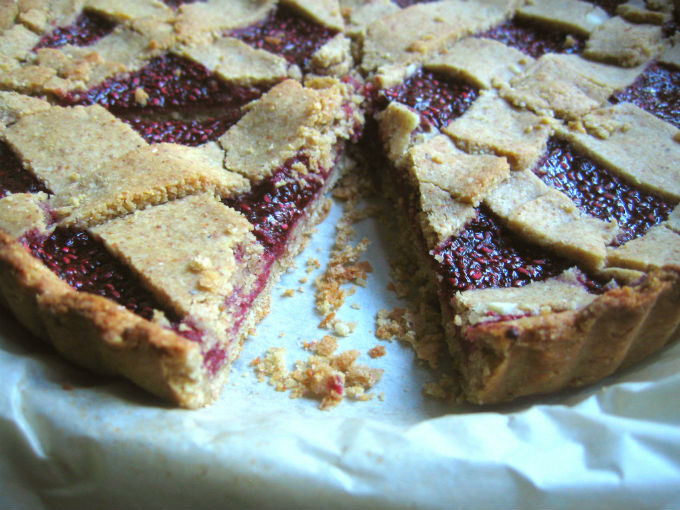 Spread raspberry jam on top of the dough in the pan. Roll out the rest of the dough to 2 mm thickness. Cut into strips, and lay them, crisscrossing your way across the top of your torte. Lightly brush the lattice with a bit of soymilk or oil (or both mixed together). Bake at 350F for 30-35 mins. Watch to make sure top doesn't burn. You can always lower the heat in that case, or cover in foil if necessary. Ready for another Friday treat? These are waaaayyyy too easy. I've made variations on these bad boys for a few years now, and I decided it was finally time to dig up the recipe for the blog. Happy weekend, friends! Quick, Easy, no added oil or sugar. Gluten Free option too! Makes 16 small cookies, or 12 medium sized cookies. 1 tsp ginger (optional, I recommend if using peanut butter, it's delicious). optional: 1/2 cup add ins such as chocolate chips, cocoa nibs, etc. Mix all dry ingredients in one bowl (except the optional add-ins). In a separate bowl combine nut/seed butter and maple syrup. I whisked them together with a fork. Drop in the umeboshi vinegar to the wet ingredients and mix. Combine wet & dry. Add a tiny splash of water if you need it. The dough will be pretty sticky, and rather thick. If using any add-ins like chocolate chips, feel free to throw them in now. Using hands make 16 cookie dough balls, and place on greased cookie sheet (if dough is too sticky, it was for me with the oat flour version, then just scoop out with a spoon). Wet a fork, and then use it to press down / flatten each cookie. Bake for 12-14 minutes or so, if making smaller cookies, & 15-18 mins for larger sized. Check to make sure bottoms are brown. They'll firm up as they cool. I've made these multiple times - sometimes with the oat flakes, sometimes without, and using all kinds of flours. I think overall I prefer the sunflower butter / oat flour combo, but T loves the peanut butter ones. Really, any way you choose to go, these are just too easy and delicious to go wrong. I'd love to hear if you try any variations on these guys. 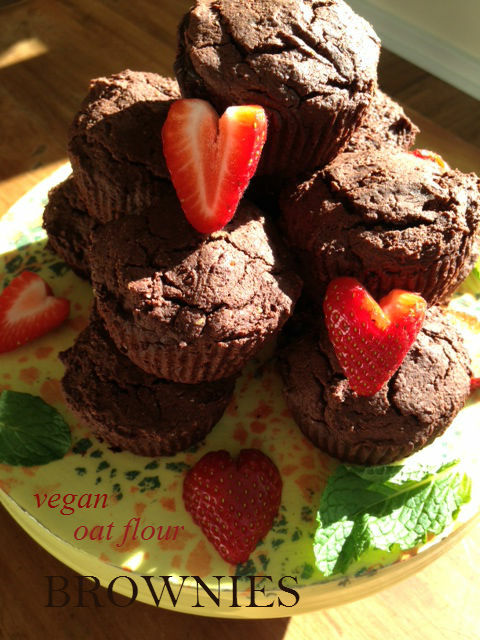 Very decadent vegan, oat-flour, maple sweetened Brownies. Quick & Easy to prepare. Makes 12 muffin cup brownies. As you'd expect from the word brownie, these are decadent and rich - not an everyday treat. Although, they're so tasty you may indeed find yourself thinking about these daily. 1/3 cup high quality vegetable oil - unrefined sesame, grapeseed, avocado etc. Optional: 1/2 cup chopped nuts like pecans or walnuts. In a bowl, combine flour, flax & baking soda. I whisked it briefly with a fork to combine. In another bowl, add the cocoa powder, salt, cinnamon & cayenne. Method 1: Add the chocolate pieces to the cocoa/spices. Then add the boiling water, and stir with a spoon until it gets all icing / fudgey like - not runny - but all mixed together into a heavenly chocolate paste. Most of the chocolate should melt, but if there are a few pieces left, no biggie. For this batch I used this method. Method 2: Alternatively you could melt the chocolate in a double boiler, and add it to the cocoa & spices. You may not need to any boiling water here, to get the icing like texture - when I tried it this way, I added just under 1/4 cup boiling water one time, and another time I didn't need any water at all. Add in the maple syrup slowly, mixing with a spoon until combined. Add in the maple sugar, again, stirring with a spoon. Stir in the flour/flax/soda mixture. And then the nuts, if using. The batter will be really thick, not runny in the slightest. Scoop out some batter, and drop into lined muffin tins (or a parchment paper lined 8X8 baking dish). Using your fingers or the back of a spoon, press the batter down into the pan or muffin cup. Bake for 20-25 minutes if using a muffin tin, or 30-35 minutes if using a pan. They are done when a toothpick comes out clean. Let these guys cool in the pan for about an hour, then transfer to a wire rack. Do not cut into slices until cooled. AND, if humanely possible, I think they taste better the next day, after spending the night in the refrigerator...but if you don't like your brownies on the colder side, then simply keep them on the counter in an airtight container. YUM! I make brownies only a few times per year...mostly because I don't often think of them! This has been my go to recipe for the past few years though, and it has never failed me. I hope you enjoy it as much as T & I do.